So, It’s been a few weeks since I’ve written here. I was on a roll with weekly posts, but just didn’t post the last three weeks. Sorry ’bout that. So, what have I been doing for all that time? Well, I made a doily. And a pair of gloves. Cigar gloves – cigar = gloves. Yarn is Cascade 220 superwash. Peacock Pride. Still needs a wash and a block, yet. Toe up socks. Knit in Jarbo Garn Raggi Multi. 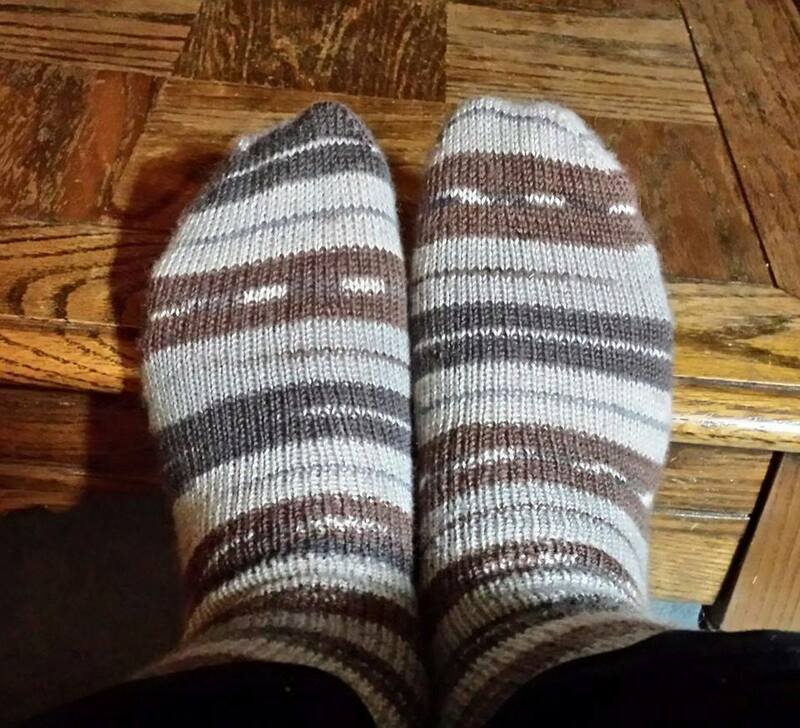 I also finished those car socks. Toe up socks. Yarn is Lana Grossa Meilenweit Merino. 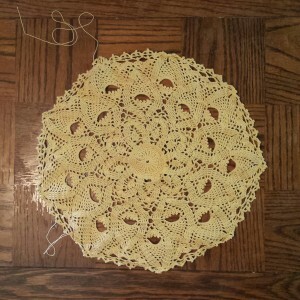 I made the Rose Medallion doily, mostly just for fun, but also for practice. I had no idea what I would do with it, but I thought it might be nice on my bedside table, if I could keep all the cat hair and dust off of it. While I was working on it, there was an ice storm and a friend of mine was in the hospital with a complicated pregnancy. The whole time I was working on it, I kept thinking of, worrying about and hoping for my friend and her family. 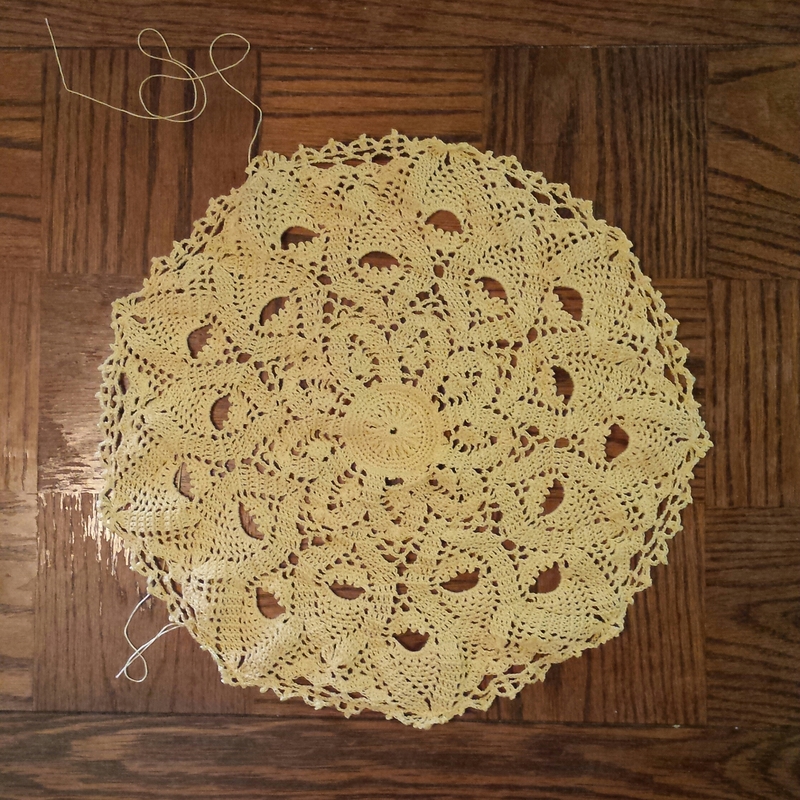 The doily felt very much like a prayer shawl. In the knitting and crocheting world, a prayer shawl is made while thinking and praying for the recipient. There was so much love for my friend wrapped up in those stitches. When I finished, I couldn’t look at it and not think of them. 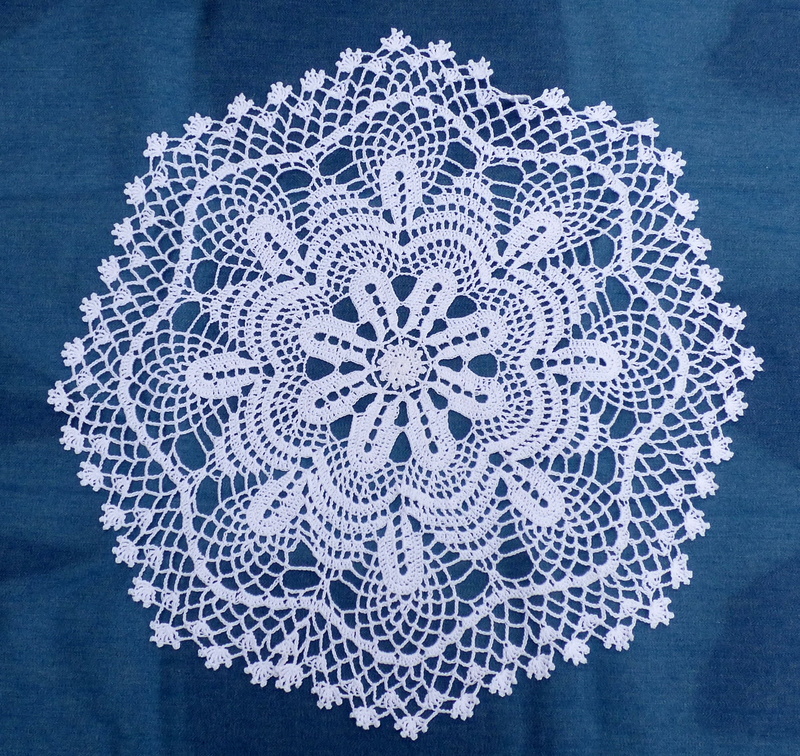 It felt to me like the doily belonged to them, so I sent it off to its new home. 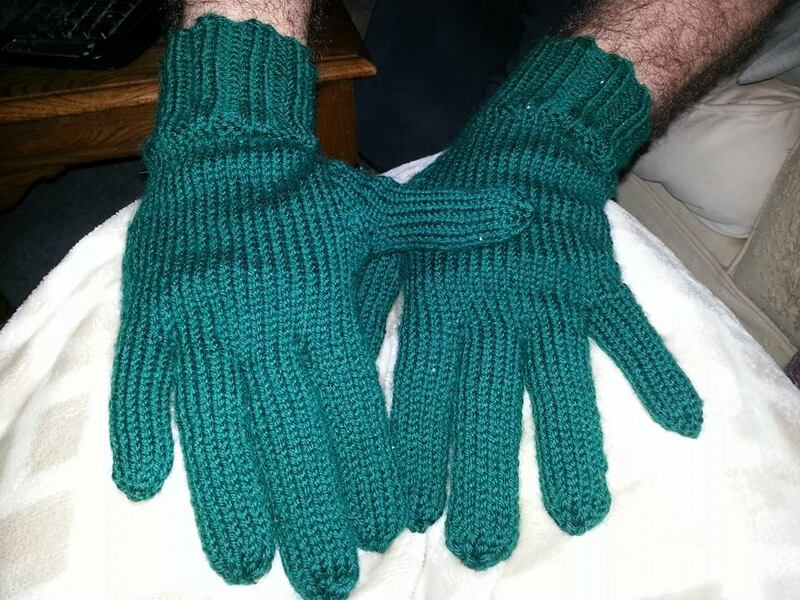 I made the gloves right as the weather was warming up for spring! What better way to get spring to come? I used the Cigar pattern from Knitty, but I just knitted all the fingers and thumb rather than leaving the thumb, first and middle fingers open. I have plans to make myself a pair, as well. Contrary to what you might think, spring and summer are GREAT times to make gloves, mittens and socks. They are small projects that travel much easier than a huge blanket or sweater. Plus, when the cold weather gets here, you’re already ready for it, rather than scrambling for warm stuff! Doily #2 is for Gigi. It’s a surprise for her birthday, so don’t tell her, ok? It’s called Peacock Pride by Patricia Kristofferson. It’s made in soft, buttery yellow crochet thread and was really fun! Crochet kinda wears me out, espeically at such a small gauge, but this was so much fun to work on, I couldn’t stop. The main motif is called a pineapple, and my Mamaw loved to make patterns with pineapples. I recently got several of the tablecloths she had made and just about every one of them had a pineapple motif. I told my husband that this was my inheritance. 😀 There was lots of crochet thread and a few unfinished projects in there, too, but that’s a post for another day. And then there are the socks. I have increased my hand-knit sock collection by 50% this winter! The Raggi socks are so fluffy and warm. They’re really great house socks, but since I have perpetually cold toes, I do wear them out of the house. All my socks are fraternal twins. I could make the effort to make sure I started both of them at the same spot in the color repeat, but I don’t really care. I like having socks that are slightly off (and it makes my OCD friends cringe! ha!) 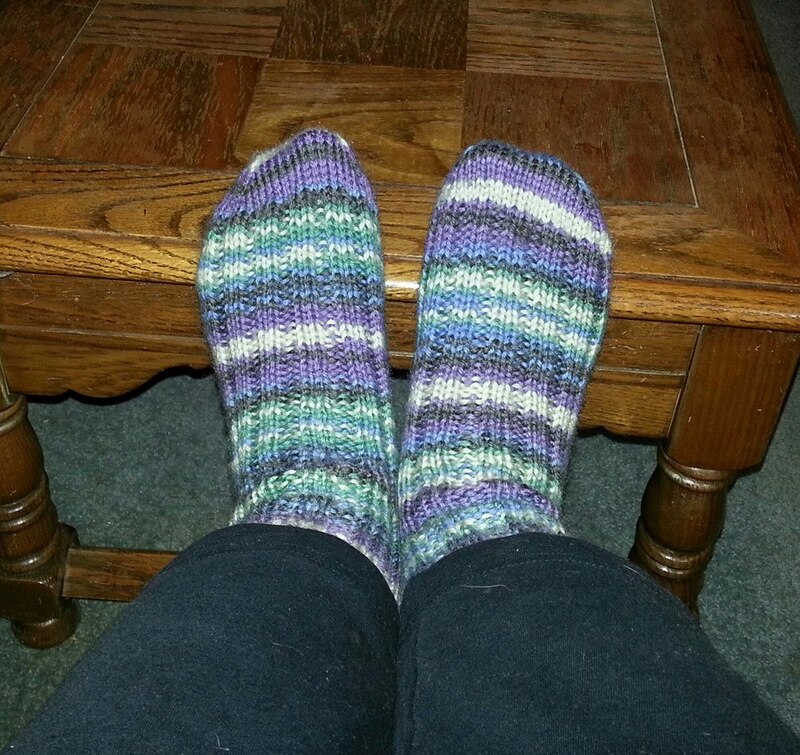 The only way I have the patience to make both socks match exactly is to knit them from a dyed sock blank. I’ve already cast on the next pair of car socks. I’ve really loved having a knitting project in the car at all times. It’s amazing how much you can get done in short bursts. It’s not often that I’m a passenger in my car – we tend to be homebodies, but we do try to go out to eat once a week and any time we’re traveling, it’s nice to have a small, easy project to work on. I am still doing commission knitting! It may not feel like Christmas to you, but I am already working on some commissioned gifts for Christmas 2015. I am also designing a family of Christmas stockings. If there’s something you want made, it’s certainly not too early to get started! Just contact me here or through my Etsy shop. 3 Responses to Howdy, Stranger! I’ve wondering if my lack of posting had rubbed off on you! As they say, like mother, like daughter. 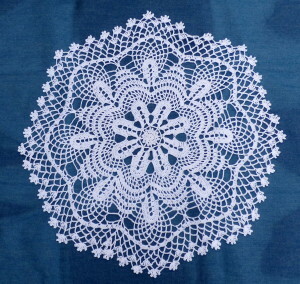 I love the doilies! Gigi will be thrilled. And I like the socks. I don’t like things that are matchy-matchy so they are great to me. You’ve been busy! Excellent work, Abby! Thanks for the update on what you’re doing and keep it up! Once again you have amazed with your creations. Such talent is truly a blessing from God.